Top-shelf Irish whiskey producer Powers has released its latest expression of single pot still whiskey, with a unique name: Three Swallow. What’s it mean? Spoiler: More than just birds. A modern representation of what the original Powers Whiskey tasted like back in the days of its original John’s Lane distillery, this latest Single Pot Still release is once again setting the standard for this quintessential style of Irish Whiskey. 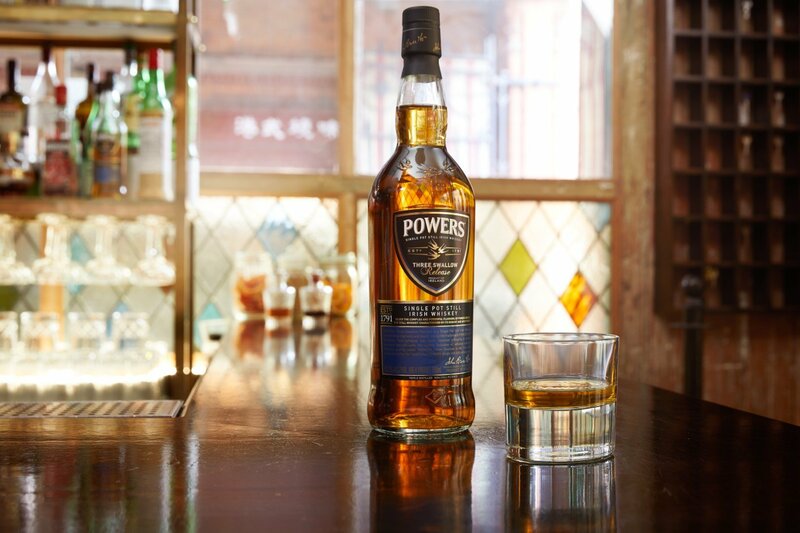 Distilled at Irish Distillers’ famed Midleton Distillery in County Cork, Powers Three Swallow is a perfect example of the traditional Single Pot Still style. Crafted from a mash of malted and unmalted barley, then triple distilled in traditional copper pot stills, Three Swallow is then matured in 2nd and 3rd fill American bourbon barrels before finishing in aged sherry casks. This method gives Powers Three Swallow Release a bold yet finessed finish, resulting in an impeccable Irish Whiskey. At first sip, the initial taste delivers rich, smooth nutty flavors followed by a wave of green apple and citrus notes – with a touch of cedar wood for extra complexity. Spicy sweetness floats atop, balanced with a hint of sherry casks, leading to a crisp cereal finish with notes of toasted oak. Just take one swallow, and savor this drop of history. The name Three Swallow is deeply ingrained in Powers’ history and has several meanings, two of which are held dear to the brand and its storied heritage. Powers’ original distillery, John’s Lane, was known for incredibly high standards, including that of its horse stables and coaches. Each coach had three coachmen – a driver and assistant up front, and another at the rear. Coachmen were accustomed to bringing a small flask of Powers on long rides, with just enough whiskey to give each man a good swallow, but not enough to interfere with his job. In addition, the migration of the Irish Swallow signifies the beginning of the distillation season in Ireland, and Powers has historically used two or three swallows to signify the age, quality, and purity of their pot still products. Over time, because of the high quality across their entire portfolio, all Powers whiskey came to bear these iconic swallows. The nose of the whiskey is a bit more aggressive than expected, particularly from the typically soothing Powers, owing in large part to that sherry finishing. Nutty, with notes of citrus peel and a heavy, growing earthiness, the aroma of the whiskey is almost overwhelming at times, evoking thoughts of coal mines and chimney soot. It’s not at all expected from an Irish bottling, and the palate continues the theme, at least to a degree. The palate at first finds plenty of citrus along with those classic Irish honey notes, but then a growing woody/smoky character quickly overtakes them. The palate ultimately becomes quite complex because of this, bouncing between sweet and savory and landing somewhere in the middle, which unfortunately isn’t all that satisfying of a place to end up. On the back end all I get is notes of charred beef, a gritty, peppery note that just doesn’t do the trick. To be sure, it’s an interesting whiskey in its own right — and quite unique — but sadly, it’s got nothing on Powers’ John’s Lane release — or even standard Powers Gold Label, for that matter.